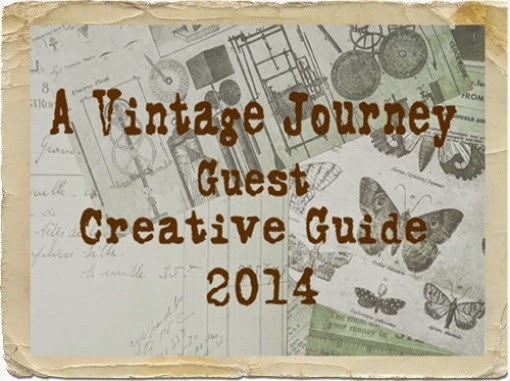 Let's Celebrate with A Vintage Journey! 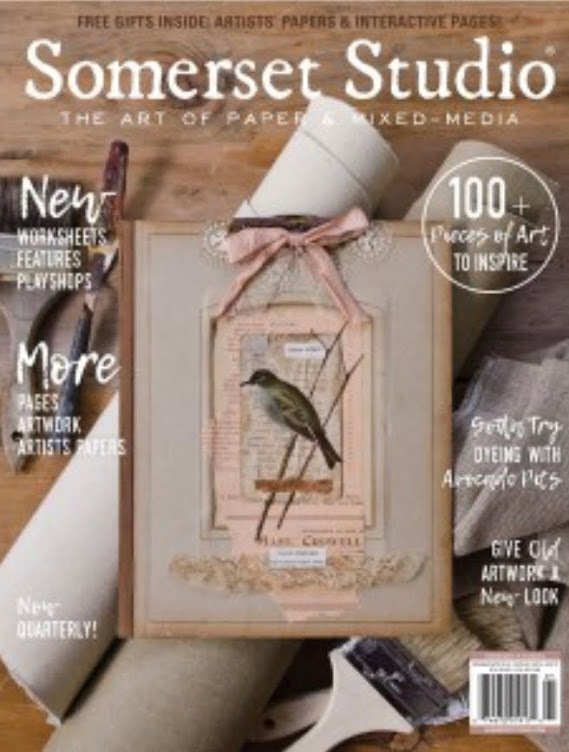 I used several Tim Holtz dies, papers, and Idea-ology pieces along with found objects to create treasure boxes to fill with presents for Christmas. The Snowflake die is glittered and added to one box with Industrious Trim Stickers, and the Vintage Santa adorns a simple box with gold ribbon trim on the sides. I loved these Skates the from the minute I saw them. To make them go with the gold rickrack, I added Alcohol Ink. 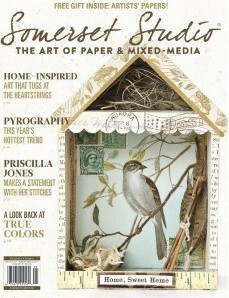 The gold pinecone pick and gold twine are hot-glued to the top. Here you can see the little drawer that slides out in which you hide your treasures. I used a large gold Christmas Tree charm for this more subdued box. It really lets the tree stand out. Some more coloring with pens and a plastic red ribbon fits perfectly on the tree top. Red Tinsel Trim is glued to the sides. White pen dots along the sides just make the tree pop from the dark green background. You can make these as simple or as elaborate as your creativity allows. I'm giving hand-made jewelry and perhaps some "Christmas Green" to the kids in them. Poppie always asks them, "What's a girl's favorite color?" They learned at a very young age that the right answer was always green....in the form of money. Thanks so much to the people at A Vintage Journey for inviting me to play here today with you. 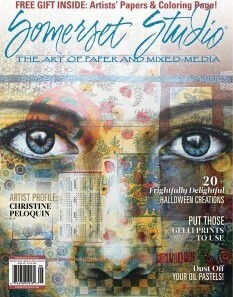 Don't forget to check out all the great projects by the Creative Artists there and leave them some love. This is a Primitive Art Doll Style 3. I changed out the wings for some longer Angel Wings 2. 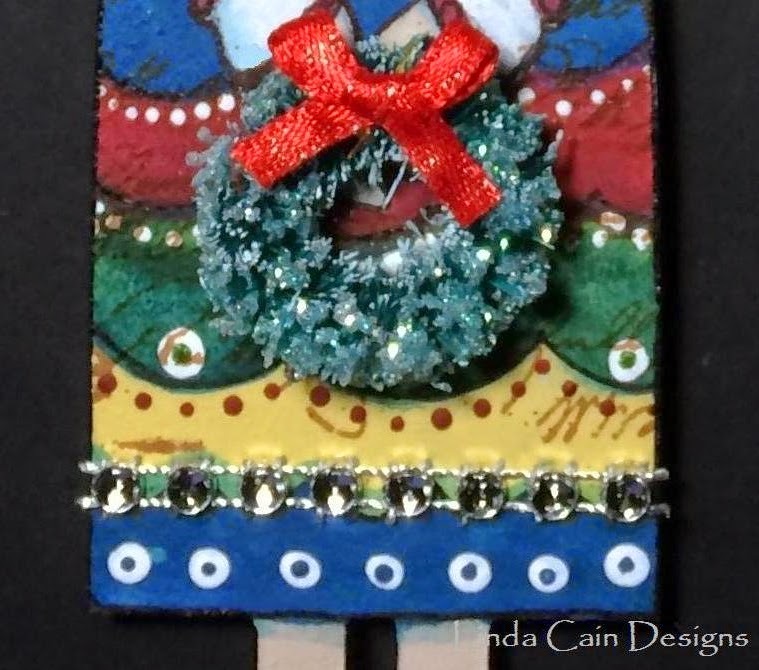 I think the little 1" Wreath highlighted with White Art Sugar goes well with the hand-painted doll using Fresco Paints, stamping with Coffee Archival Ink, and white Sharpie Poster pen marks. This Silver Sequined Trim is VERY cool that's along her hemline area. It really sparkles like crazy, but the cuts are recessed. Amazing. Just click on the links and it should take you right to the product you're looking for. The Gold Luminous Glitter is from Finnabair that's on the Wings and Headpiece. Add your favorite wire with some twists in it to holes in the wings and she's ready to hang on the tree. 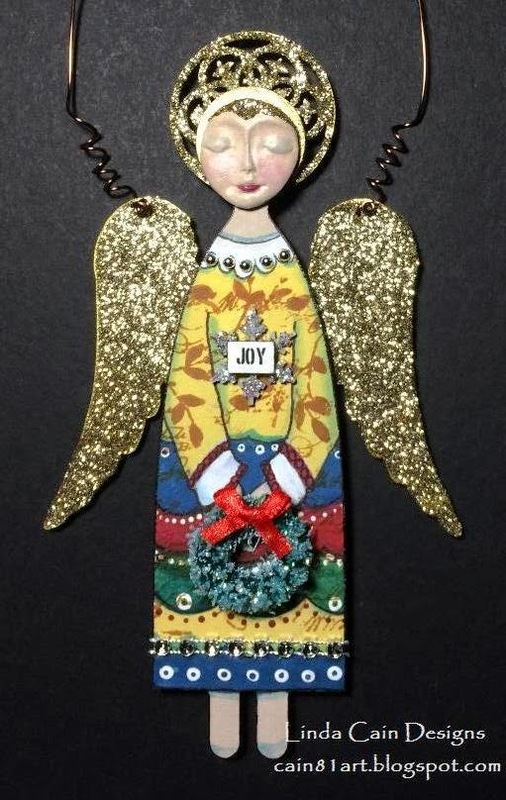 Here's one last little Angel made with Primitive Angel Art Doll Kit #4, and a Peace Dove Cut Out, a Banner Cut Out, a Round Stained Glass Window Cut Out, and more of the above supplies. Any questions, just leave me a comment. I think you've seen the tutorials and are probably bored with them, so I'm shortening blog posts for you. 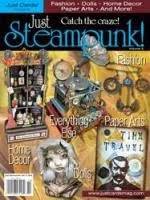 I have always been drawn to anything Steampunk, so this was a work of love for me. I start with a plain paper mache mannequin that I painted with Heavy Black Gesso. Next I added several colors of Silks acrylic paints to the body, and gold acrylic paint with Treasure Gold pastes to the stand. 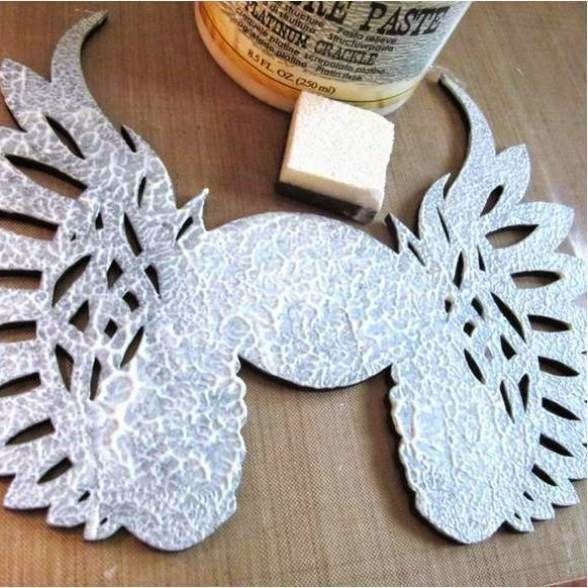 The large Steampunk Wings were covered with Platinum Crackle Texture Paste using a sponge square. I glued strips of trim in a criss-cross design onto the mannequin, then sprayed with different colors of ArtDeco Acrylic Shimmers. I added large black Ric-Rac and other trims and lace to the bodice. Then more paint and Treasure Gold pastes. 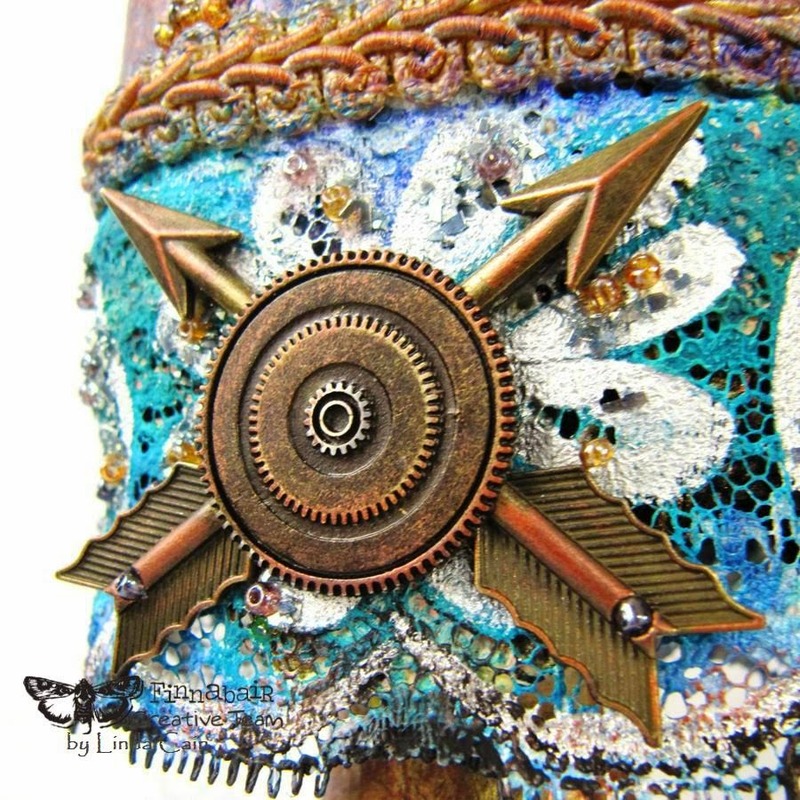 This is a close-up shot of the lace that's been painted with White Gesso as the last layer, and dazzled with Glass Beads and Glass Glitter using Matte Gel. Now I start to lay out the pieces of metal for the next layer. I painted the Leaves with Silver Mixative Alcohol Ink to brighten it up. This Large Flower Mechanical has the center removed so I could use it as the collar. The Label Plate is sanded and polished with a Vintaj Reliefing Block to make the high points shine. Then I painted the accents in with Vintaj Patina Paints. The Prima Paper Flowers have a dusting of Antique Silver Art Sugar, and the Medium Flower Mechanicals are glazed with Copper Inka Gold. I added the Glass Beads with Gloss Gel to the openings in the Leaves and the trim. Copper Inka Gold is rubbed over these as well. The Vintage Center is glued over 2 brass arrows with more Copper Inka Gold. I used a Tassel on the collar and added some large Turquoise Pearls. The various gears and Mechanicals are glued to the wings with 3D Matte Gel. Each wingtip has a black rhinestone. The Wings are colored with Distress Inks and a final topcoat of Copper Inka Gold Paste. Thanks for stopping by, leave a question and I'll be glad to get back to you. And don't forget to check out the links below for all the great products I used. 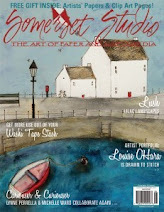 Always check out the fantastic projects that Finn and the Creative Team post on the blog here. Finnabair Mechanicals: Tassel, Plated Labels, Flowers Large, Flowers Medium, Leaves 1, Vintage Centers, Washers #1. 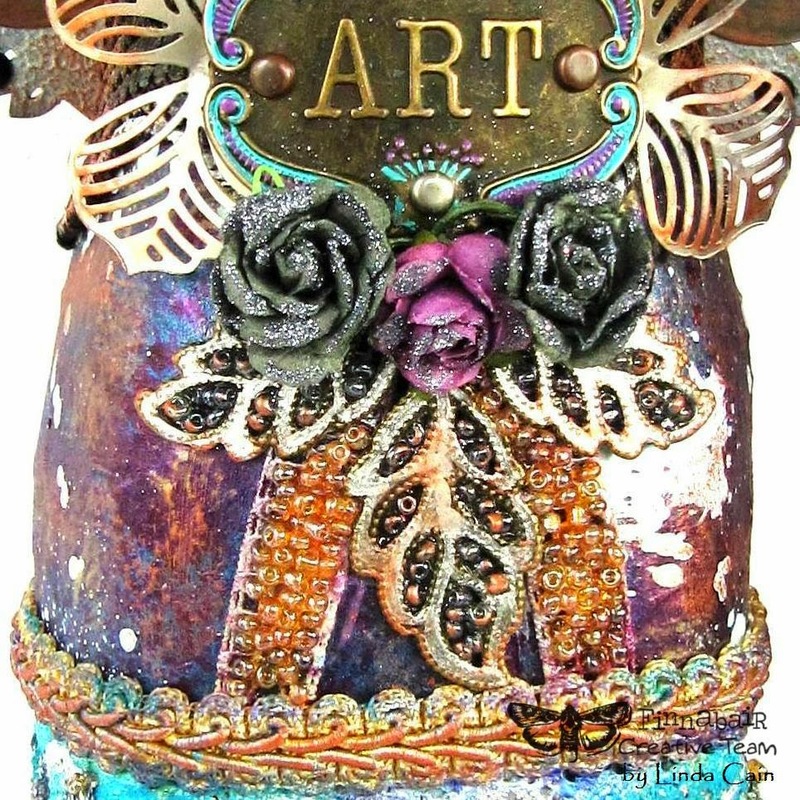 Other Products at Mixed Media Place: Vintaj Patinas-Verdigris and Amethyst, Distress Inks-Black Soot and Seedless Preserves, Silks-Teal Zircon, Key Lime, Boysenberry, Alcohol Ink Mixatives-Silver. 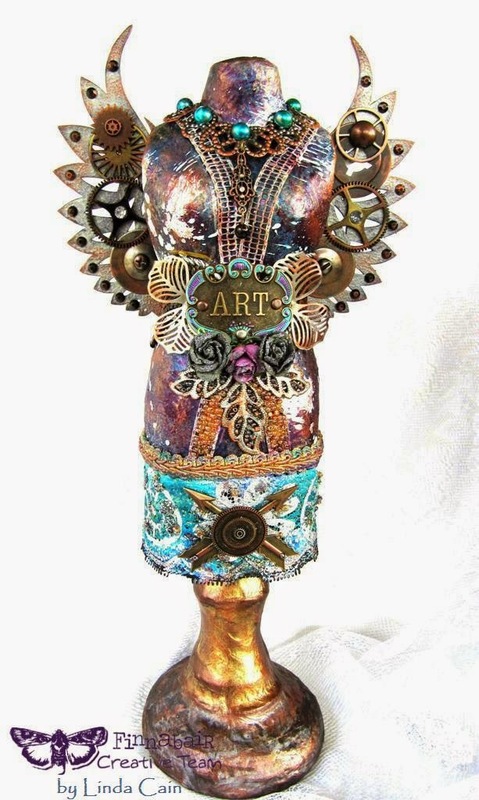 Treasure Gold-Rose and Quartz andTreasure Brass, Inka Gold Metallic Rub-Copper, Paper Mache Dress Form, X-Large Black Ric-Rac, Vintaj Reliefing Block, Various Gears and Ephemera, Black Rhinestones, Turquoise Pearls, Lace, Trims, Junkyard Findings. Here's my project showcasing GLITTER! Yes, it's time to start getting some Christmas projects going here. I start with a 6" foam cone and a piece of 12x12 cream sticky-backed canvas. Lay the cone at an edge and roll it across the canvas drawing a line at the bottom as you go. I added scallops along the edge with pencil. Cut out the shape, draw a line where the 2 sides meet, and trim. This shows the cone, canvas and wooden pedestal I'm going to use. I laid the canvas on a piece of plastic packaging and added a coat of Heavy Black Gesso. I wanted to try 2 color combinations, one light and one dark, so I also cut a piece of white canvas. Here I used Clear Gesso mixed with 3 colors from the Luminous Glitter Set. I spread this mixture on the canvas using the Honeycomb Stencil. Then I sprayed with several colors of Perfect Pearls Mists.This was perfect for setting under the tree. The contrast is gorgeous? 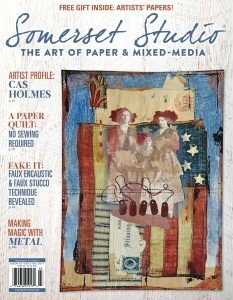 On the Black Gessoed canvas, I used the Netting Stencil with Modeling Paste. When dry I again sprayed with Perfect Pearls in blues, purples and golds. Remove the backing and add to your cone just above the scallop edges creating a pointed top. I added strips of double stick tape to the edges to hold it securely. Using a flat brush, I added Soft Gloss Gel to the the stenciled areas and sprinkled White Art Sugar, White Luminous Glitter, and Platinum Glass Glitter. They all actually have this gorgeous blue that comes out in them. I let it dry and then lightly shook the excess off. 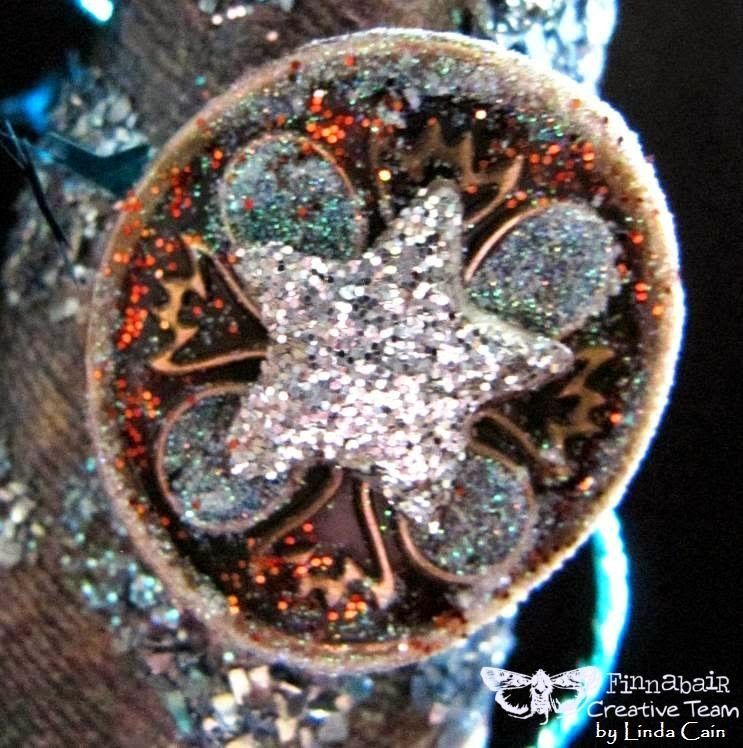 Two little wooden stars and a large Star Brad were glitzed up with Soft Gloss Gel and Silver Luminous Glitter. They were added to the Mechanicals with 3D foam squares. The Small Flower, Medium Flower and Washer Mechanicals were slightly curved to fit onto the cone. 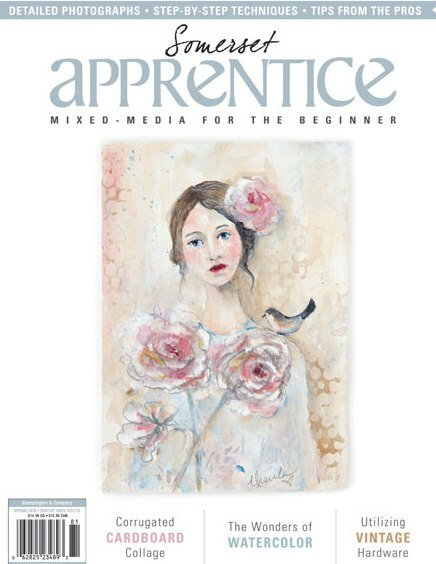 I brushed on Soft Gel and then sprinkled with Copper Luminous and White Art Sugar here. 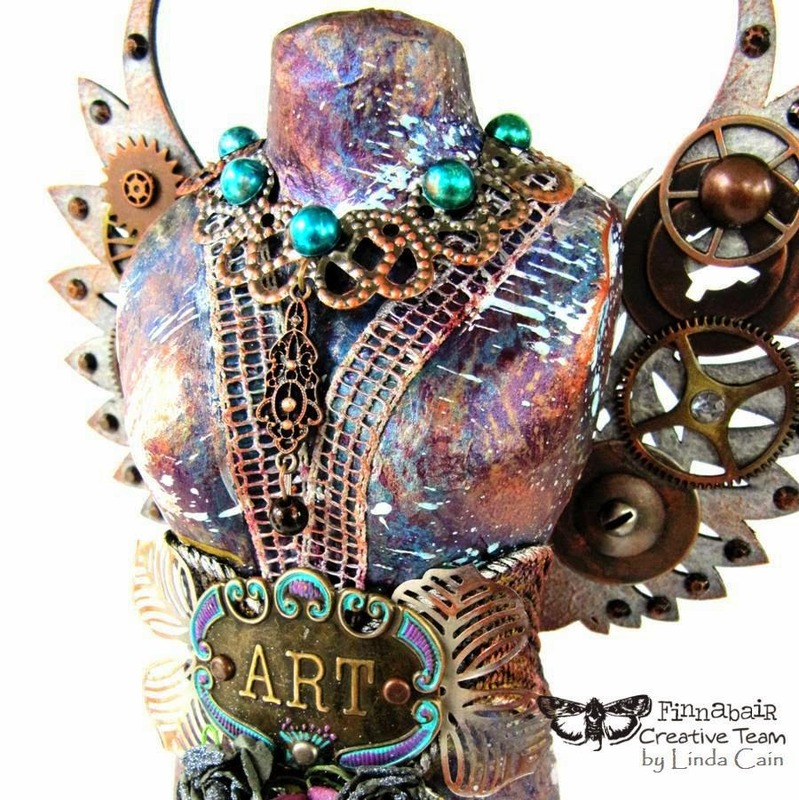 The brass color of the Mechanicals contrasts with the Copper Glitter and Art Sugar.. 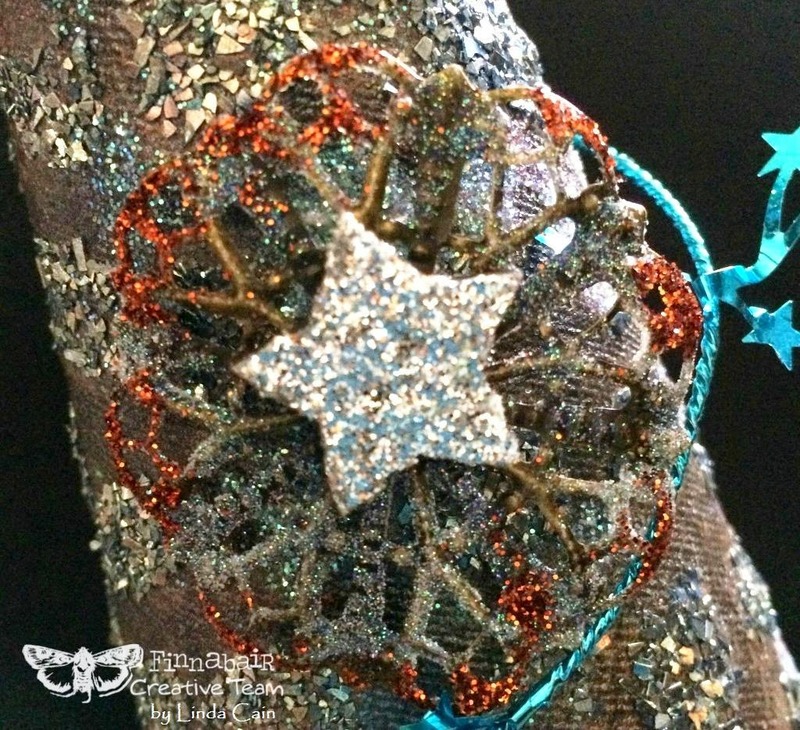 The Turquoise Garland was a perfect match for the other blues in the glitters, and the large clear rhinestones add just a bit to the scalloped edge. 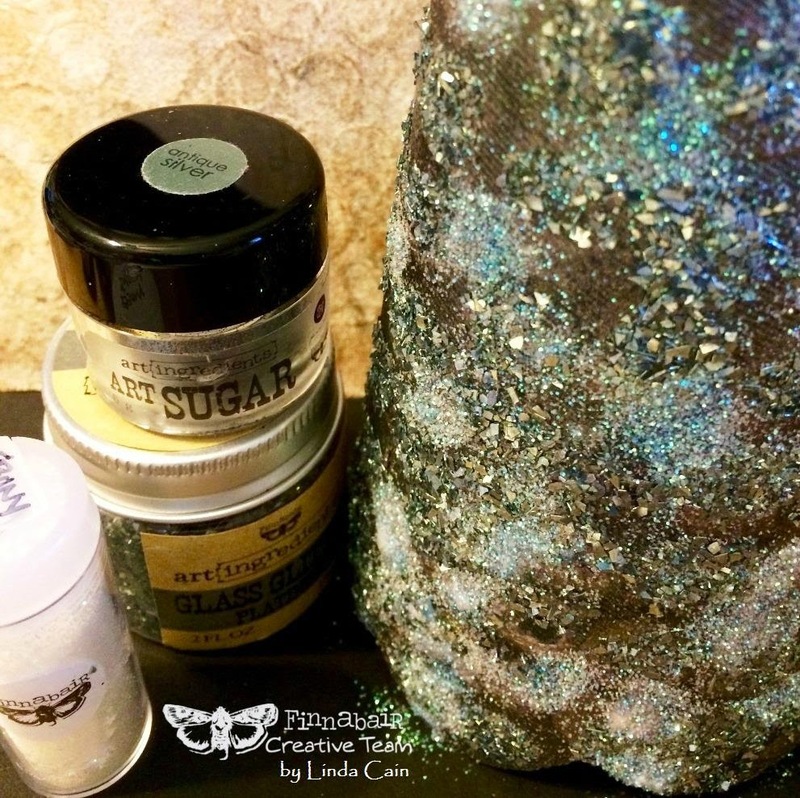 The wooden pedestal is painted with Heavy White Gesso first and then, using Soft Gloss Gel, I added Sterling Glass Glitter and Pearl Glass Glitter. It was then glued to the bottom of the Styrofoam cone with 3D Gloss Gel. so please check them out and leave them some love! Prima Products Used: Heavy White Gesso-961442, Heavy Black Gesso-961459,Soft Gloss Gel 961435, 3D Gloss Gel-961381, Modeling Paste-961411, Glass Glitter Pearl-961633, Glass Glitter Platinum-961664, Glass Glitter Sterling-961626, Luminous Glitter Set-961596, Art Sugar White-961800, Stencil Netting-961275﻿, Stencil Honeycomb-961268. Prima Finnabair Mechanicals Used: Star Brads-961169, Small Flowers-960407, Medium Flower-960315, Washers-961060. Other Products Used: Wooden Star Buttons, Turquoise Star Garland, Black Foam Squares, Perfect Pearl Mists, Clear Rhinestones, Wooden Pedestal, Sticky Back Canvas. I just LOVE how this little Votive Church Shrine turned out!!! You've got to love the gorgeous glittery trees and roof, and the Deer are just perfect in this setting. If you follow me, you know I like to base-coat my Coffee Break Design pieces of Masonite with Heavy White Gesso. Here, when using glitter, I always paint the next color the same color as the glitter I'm going to use. I learned how to work with glitter from the Glitter Queen herself, Lisa M. Pace. 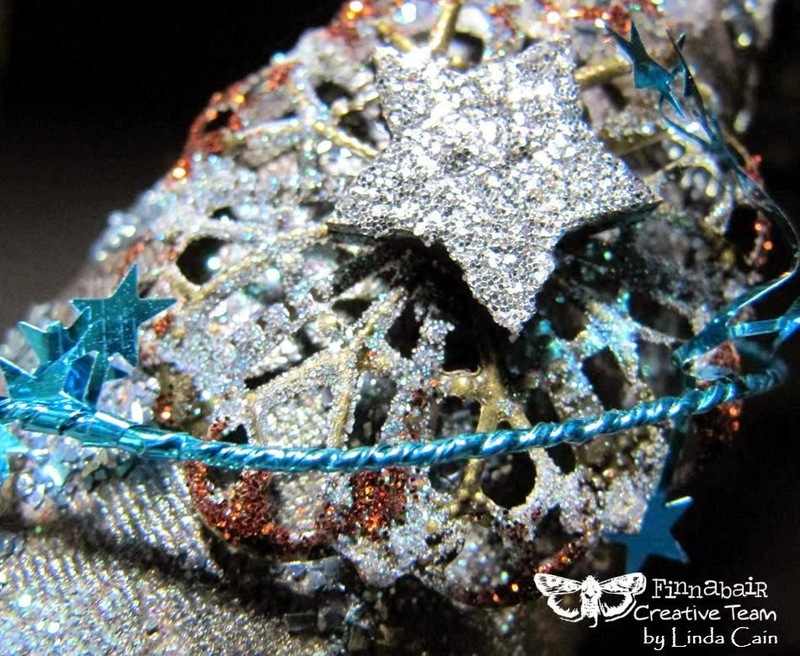 Her work is fabulous, especially when it comes to sparkle. I've used Kit 11, but there are 2 other little shrine kits with subtle changes. They're all wonderful. This one comes with the cross for the top that I added Luminous Gold Glitter to with Glossy Accents. I painted the pieces of the Shrine and added the glitters to them when dry. The gold around the windows makes the warmth of the votive light really shine. These kits are put together with a light coat of Soft Matte Gel or 3D Matte Gel. The Deer come in ivory or brown. I had 1 brown and 2 ivory, so I just painted the 2 plain ones with Butterscotch Alcohol Ink. The snow is Glitter Snow that is spread onto the masonite base. It has some Soft Gloss Gel and Silver Luminous Glitter added for a bit more sparkle. The Trees and Wreath already have a bit of white paint on them, but I added Glossy Accents and White Art Sugar to them, too. They actually have a beautiful blue sparkle in spots. The roof has a coating of Glossy Accents and a Luminous White glitter added. 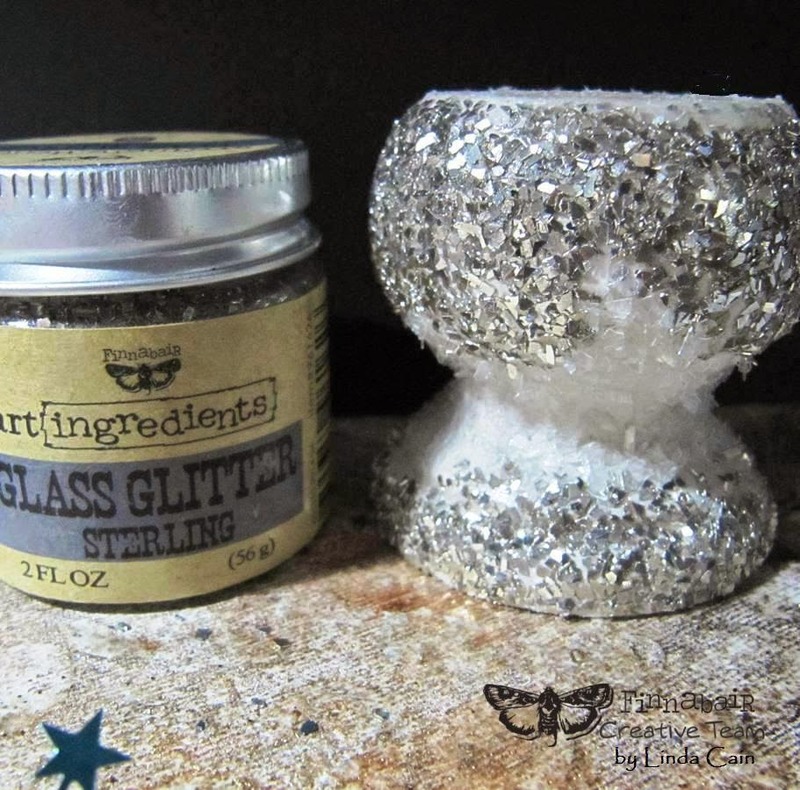 It's a bit coarser than the Art Sugar, and BOY does it SPARKLE! The front of the Shrine has touches of Art Sugar here and there, not a full coating. and the bell tower is coated with Antique Silver Art Sugar. This stuff is absolutely amazing, and goes such a long way. Add your electric votive candle and it's ready to warm up your coffee table to get you in the mood for Christmas. Check out the links and send in your order to Kristin. And don't forget to check every Wednesday for Random Wednesday and a chance for a prize! Retro Cafe Art Products: Votive Church Shrine Kit, 1 inch Green Bottle Trees WITH SNOW, 1.5 inch Green Bottle Trees WITH SNOW, Mini Green Sisal Wreath, Art Sugar-White, Art Sugar-Antique Silver, Glossy Accents, Soft Matte Gel, 3D Matte Gel, Heavy White Gesso, Glitter Snow, Tiny White Deer, Tiny Brown Deer, Butterscotch Alcohol Ink, Battery Powered LED Votive Candle.